This year’s series of Oxjam events for the Oxfam charity will launch with a four night London run of dates headed up by 2manydjs, Eliza Doolittle, Totally Enormous Extinct Dinosaurs, Skream, NYPC, Dry The River and Chad Valley. The launch shows will take place from September 23-26 at a secret east London venue, before the Oxjam Festival happens throughout October, across the UK. In a brand new location, the first launch gig will take place on September 23, with sets from Dry The River, Roosevelt and Josephine. 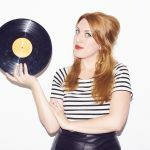 The following day will see performances from Eliza Doolittle, Fuse ODG and recent NME Radar star Chloe Howl – pictured – whilst on September 25 2manydjs will headline the secret venue, playing a set made up of records found in the record donation vaults of Oxfam Dalston. The DJ duo commented: “We’ve found a fair few records in Oxfam shops around the UK, so have been in some way or another supporting the charity for years! But this is our first time playing an Oxjam gig and we want to encourage people across the country to get involved in the festival and buy records at their local Oxfam.” NYPC (formerly New Young Pony Club) and Chad Valley will also perform, as will Dave Okumu from The Invisible, who plays a DJ set. The final launch event, on September 26, will feature appearances from Totally Enormous Extinct Dinosaurs and Skream, who play a back to back DJ set. Limited tickets for all evenings are available by clicking here. Details of the venue will be released the week before the shows.